The University of Minnesota has already scaled back its initial plans for new athletic facilities, but many are pushing for construction to begin within the next two months. The (current) initial phase is estimated to cost $150 million. The U has reported private contributions of approximately $70 million, but much of that amount is only pledged, with agreed-upon cash payments to be made over the next decade. It appears that the Athletic Department will need to take on more debt in order to move the project forward in the near future. So, what has the U’s debt load looked like as compared to its Big Ten peers in the past and how might things look in the future? Today, we look to answer those questions. Ask LNH: Can all Gopher Newcomers Play in Spain? The Minnesota Golden Gophers will travel to Spain in August for a foreign tour. Based on this year’s roster make-up, we believe this timing is optimal for the program. Media reports and many fans say that all Gopher newcomers, including transfers who will sit out a year in residence in 2015-16, will be able to take part in practice prior to the trip and travel/play in Spain. Thus, the question: Can all of the new Gophers really play in Spain? We had nailed Minnesota’s Big Ten finish for the first few years we made predictions, but failed this past season. They underachieved. We’ll have more prior to the start of the 2015-16 season, but the reality is the defense failed. 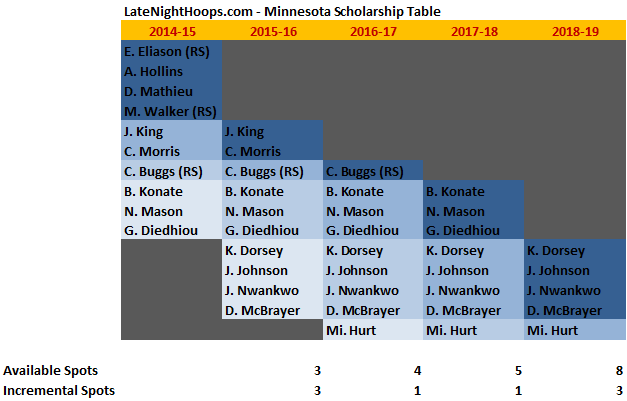 From a turnover and steal perspective, Minnesota was elite. However, we knew that wouldn’t be enough and it wasn’t even close. The opportunity for young kids to make their mark has never been greater for this program – and there are many new faces. 2015-16, if nothing else, will be entertaining. The Gophers have a veteran core. Their offensive efficiency can be similar to last year and their defense can improve substantially, but they’ve got a ways to go to compete for a Big Ten title. Minnesota’s kenpom adjusted offensive efficiency was ranked #43 in 2014-15, which was similar to the previous year’s ranking of #40. However, the Gophers saw their adjusted defensive efficiency ranking fall from 82 to 106. We talked about it before, during and after the season: Stealing was not the answer. Indeed, Minnesota’s steal rate of 13.6% and defensive turnover % of 24.7% were both elite and far above the previous year (11.5% and 18.7%, respectively), but their defense had bad issues that offset the good. 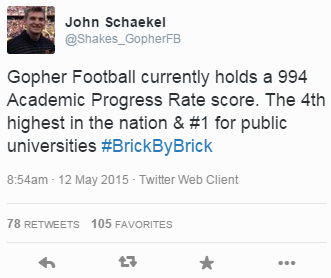 Fact Check: Does Gopher Football have the #1 APR among public universities? A couple of weeks ago the Minnesota Gophers’ football recruiting coordinator tweeted that Minnesota football currently holds a 994 APR score, making it the fourth best in the nation and #1 among public universities. Then, on May 12, assistant recruiting coordinator John Schaekel tweeted the same thing. These gentlemen hang out with football recruits and their families. To be able to say the football program has the best APR among all public universities is a great thing to be able to share… but is it true? 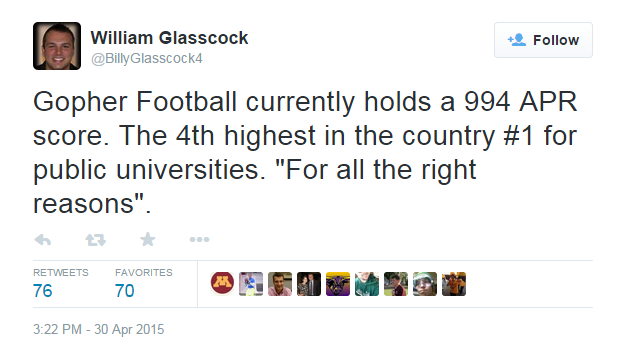 Question: Does Gopher football currently hold the best APR among public universities? In Richard Pitino’s first season, the Minnesota Golden Gophers shot an impressive 52.3% eFG in Big Ten games (#3 in conference). This year that figure is down to 48.4% (#9) and is the primary reason they’re not scoring as well in 2014-15 (on a points per possession basis). The team’s 3-point shooting isn’t the issue. This year’s squad is shooting better (35.1% vs. 34.5%) and more often behind the 3-point stripe. (37.7% 3FGA/FGA vs. 34.6%). Minnesota’s 2-point shooting has taken a significant dip from 52.5% (#2 in B1G) to 45.9% (#10). Free throws (9/19 for 47.4%) get the attention from many, but they weren’t the primary issue in Minnesota’s loss at Nebraska. Although the Gophers could have used some more made free throws in the 52-49, there were more important factors to them losing. The biggest one factor was 2-point field goal shooting. Their mark of 25.0% (8/32) was the program’s worst performance going back at least five years. Had Minnesota made slightly less than the D-I average of their 2-point attempts (D-I average is approximately 47.5%; Minnesota averages better than 50.5% on the season), they would have scored an additional 14 points. Free throw percentage is nearly irrelevant to a team winning or losing a basketball game. The table above has been updated to reflect the commitment of 2016 Michael Hurt and the assumption that Daquein McNeil will not return to the program. Notes and details on the Gophers’ team and player stats (see PDF) through the first four Big Ten games are included in this article. Minnesota’s eFG% lags far behind their opponents, but in two of their four losses the Gophers have shot better than the other team. at Purdue – 72-68 loss: Minnesota was the better shooting team, but Purdue held slight edges in turnovers and rebounding and a big advantage in free throw rate. at Maryland – 70-58 loss: The Gophers shot a miserable 36.1 eFG%, the worst performance of any Richard Pitino-coached team (including FIU).